Joomla have launched a brand new service in collaboration with Siteground that is going to see it going head to head against WordPress.com - For the unfamiliar, WordPress.com is different from the self hosted WordPress.org CMS that you can download to your server and set up. 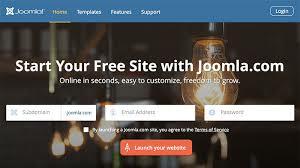 Joomla.com is going to allow people to set up websites for free so they can expereince the delights of Joomla in a extremely similar way that people do at the moment with Wordpress.com. If you are starting out in business or just want to start a personal blog then do give Joomla.com a try and let me know how you get on. As time has gone by - I just started using Joomla as 2.5 came in and there have been a lot of changes since then. Most notably is the one touch upgrade system - again in a very similar way to the way that Wordpress has developed. The one touch system will upgrade your version of Joomla as new improvements and security fixes are approved. The mechanism for updating components has also improved. In times gone by having to upload them via FTP could be a little troubling but now the one system that tells you the administrator what components are out of date and again being able to do that one click upgrade really helps smooth the process for inexperienced users and experienced alike. This one system for upgrading components and the insistence of Joomla itself that developers build in the process for using this one click upgrade really helps give admins the ability to upgrade and walk away and concentrate on bigger issues. 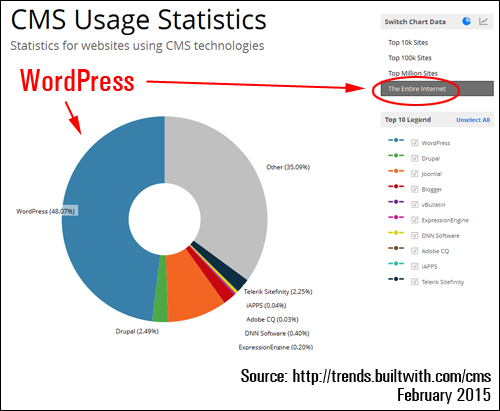 So Joomla is definitely heading on the right direction and can be seen from the graph below (the orange segment) it still has a long way to catch up on WordPress but long may she reign.